On Friday 20th September all of the first graders went for an integration trip to Piasek. We went off at about quarter past nine. The way there took about twenty five minutes. When we got there we had some free time so we walked around the theme park and had a look at some of the miniatures of famous old castles and stuff. After that we practised our class presentations, had some tea and a piece of cake. Then the presentations started, people were quite stressed out, but at the end everyone found it funny. During the performances we got to know each other better and laughed our heads off. At about twelve karaoke started and people were singing and dancing. Our form teachers loved all the shows and at about 3 pm we went back home. I think everyone had a good time there and would like to go on another trip like that! Special thanks to Kuba Surma from 1g and Michał Worwong from class 1f who were taking photos during the trip. 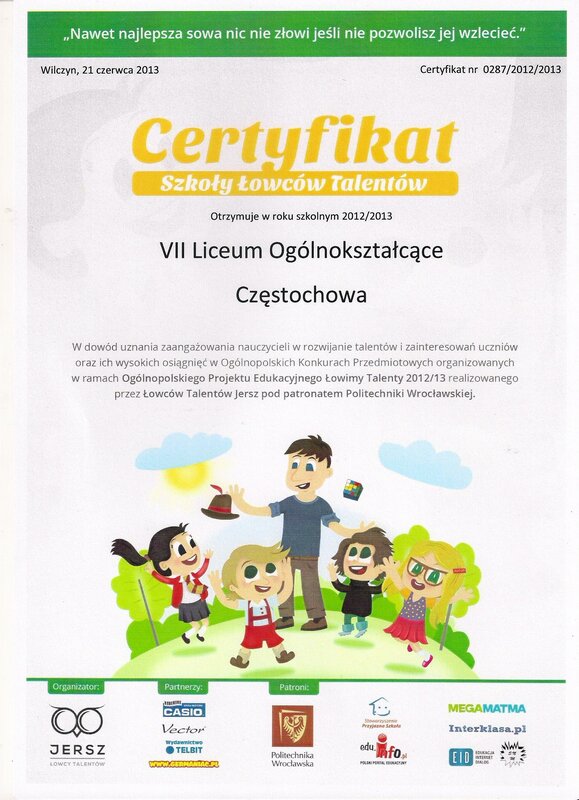 We have the pleasure to inform you that our High School was awarded a unique certificate called “Certyfikat Szkoły Łowców Talentów”. Only the schools with more that two winners of the nationwide competitions can get it. As the three of our students were the prize-winners (laureates) in English High Flier Competition, we had the chance to achieve it this year. English language competitions are among some other ones involved in Nationwide Educational Programme “Łowimy Talenty 2012/2013”, under the auspieces of Wrocław University. We would like to congratulate once again the best students and their teachers: Julia Jureńczyk (now 2f), Monika Freus (now 2c) and Justyna Błaszczak (previous 3b) and Mrs Marta Leśniak and Mrs Marzena Kossak-Wąchała. Same more details about the results can be found in the post entitled “English High Flier Results” (6th February). Now it’s 2nd September and it is time to come back to school for second and final year students. This time is special for those students who begin their education in our High School. That is why we would like to welcome them with open arms! We hope first year students will find KopernikHigh School a good place to learn and find new friends.